This is my first Foodie Penpal reveal. I joined the scheme after some of my twitter followers had started. It’s a lovely idea to allow people to spread foodie delights around to new friends and contacts. This month, Anna from Nottinghamshire sent me a parcel and I sent one to Caitlin in Cornwall. We love foraging and, with my assistants’ help, I make a lot of jams & preserves. So the two jars you can see are of dandelion marmalade and blackberry & apple jelly. I am delighted with both and especially the dandelion marmalade. I had seen a number of people on Twitter had made it this year and never got round to make it myself. It’s a rich, fruity conserve, with marmalade bite and smooth sweetness. 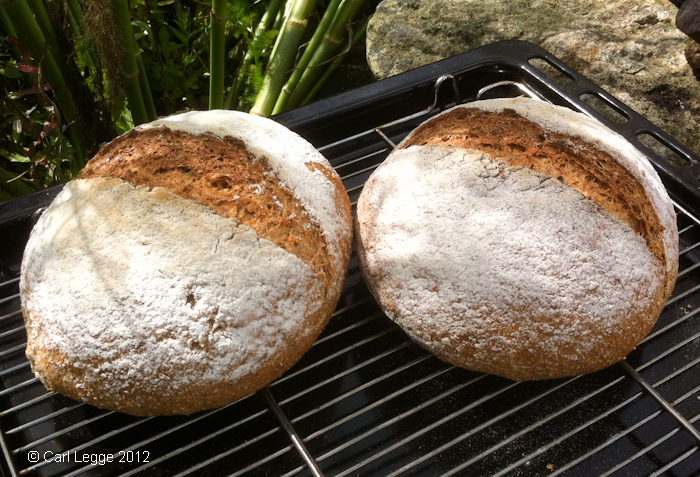 It went really well on some fresh wholemeal & spelt bread I made. The blackberry & apple has a lovely hedgerow flavour and colour with a delightful soft set. We’ve yet to try the Stilton cheese. I’ve just made some digestive biscuits which will go really well with it. We’re looking forward to that very much. We were also fortunate that Anna loves smoked fish & charcuterie. Anna also has a smokehouse local to her. 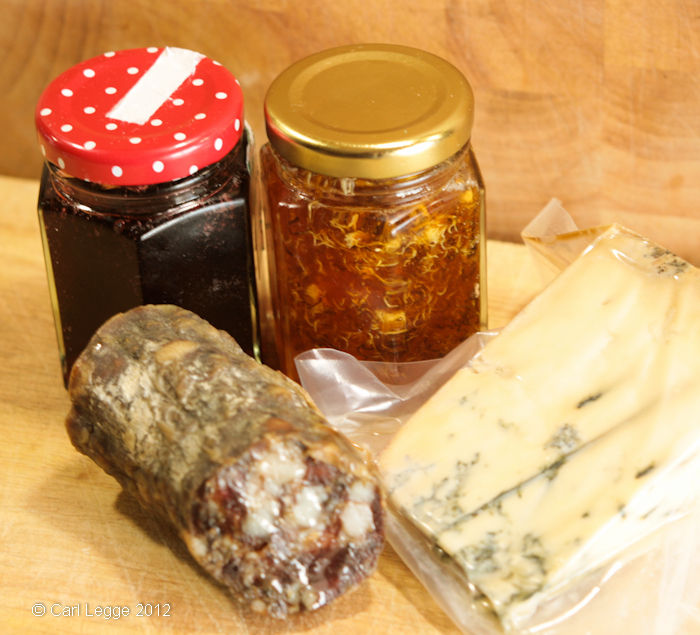 So we received some gorgeous locally made preserved goods. The fennel sausage smells as good as it looks and was to die for in flavour. A treat indeed. 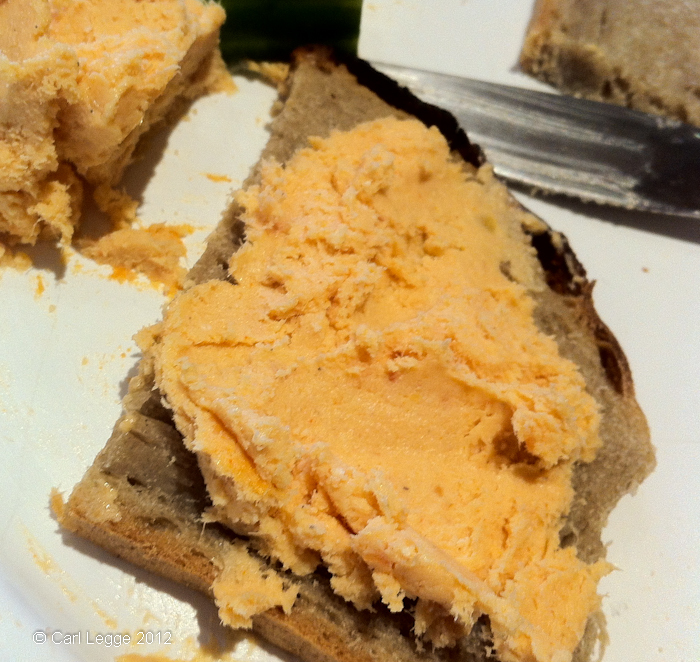 Also, Anna sent us some gorgeous smoked salmon pâté. I’m afraid it didn’t last for my collected picture of the parcel goodies, as we ate it. It was only once we were tucking in that I remembered to photograph it. So apologies for the dodgy iPhone picture of my plate. All-in-all, I’m very glad I signed up for Foodie Penpals. I had a lot of fun putting together the parcel for my penpal. The goodies I received from Anna were a delight and gave me some tastes that I would not have otherwise had. 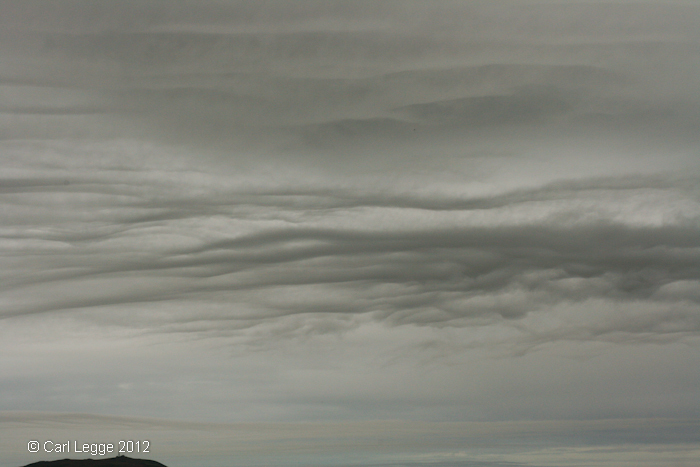 We had a very nice cloud formation this morning. 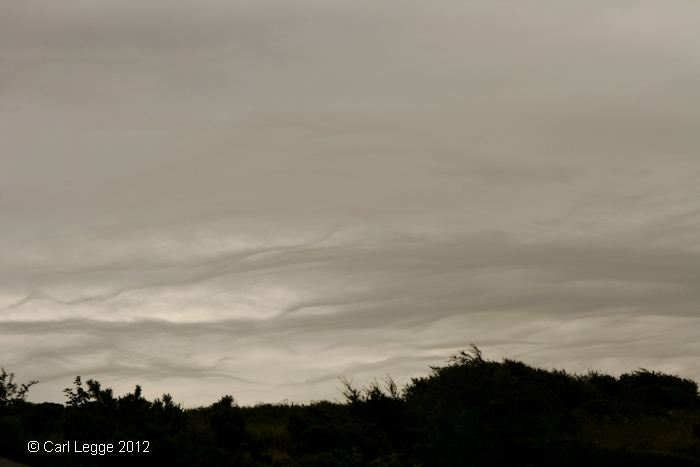 Air currents had formed these pretty waves in the lower cloud. 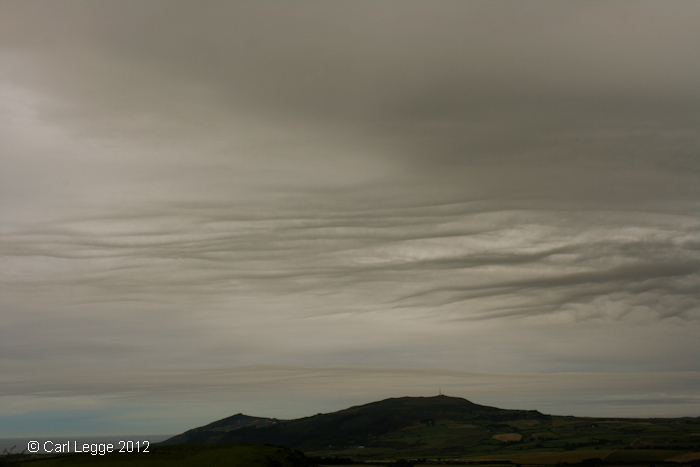 Here seen above Mynydd Rhiw looking south-west from where we live. And here looking south in the direction of Abersoch. And this slightly further west. It’s a dull day light-wise but we have some good weather. One of the benefits for us to live on the side of a mountain is that we get a lot of sky to look at. Bendigedig! 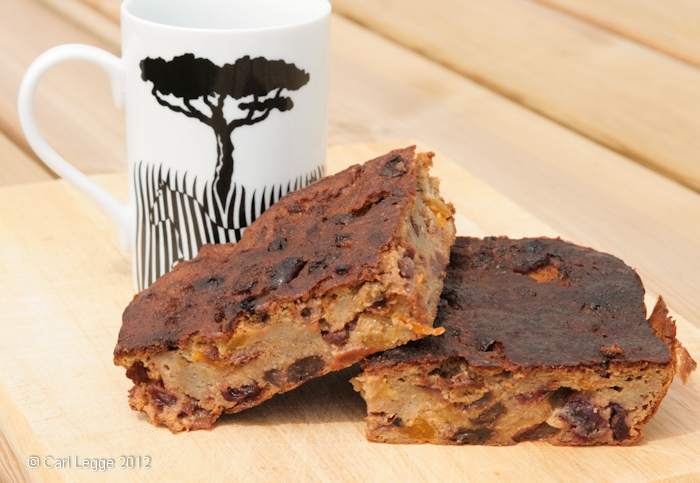 The rubbish ‘summer’ weather we’re having prompted a need for comfort food. I had a surfeit of bits & bobs of sourdough loaves in the bread bin, so bread pudding called to me. Instead of just using the normal dried fruit, I wanted some sparkle in the pudding. The vibrant orange of apricots and red of cranberries were ideal for this. The fruit gives a lovely zing to the pudding to brighten up dull & wet days. Yesterday, Mel at Edible Things tweeted a link to a great idea for food bloggers and blog readers to get to know each other, by sending a lovely parcel in the mail every month. I re-tweeted the link to the US & UK schemes and soon got into a chat with Mel and Karen at Samphire Shop. Karen suggested that we should set up a similar scheme for seeds. It’s a brilliant idea and this blog post is about that. Participants are then matched. It’s not a swap: so penpal A will send to penpal B; penpal B will send to penpal C.
Penpals send out thoughtful, food related parcels. The parcels can include home baked treats and/or shop bought treats (especially local or unusual things). The price limit for the boxes is £10. At the end of the month, everyone blogs about their box, or writes a guest blog post if they are usually a blog reader and not writer. Everyone reads one another’s posts and rejoices some more. Posts are made available on the hosts’s blog. 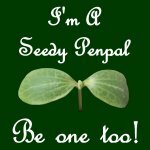 The idea for the Seedy Penpals is that we do the same sort of thing with spare seeds. These could include you favourite commercial varieties, heirloom seeds and home-saved seeds. It’s a great way of discovering new things and making new friends. We would like to see whether there are enough people interested in the idea to make it worthwhile. And we’d also like to find out how you think it should be run. So I’ve put together a little survey which we’d like you to complete. It’ll only take a couple of minutes, so please, please fill it in. There are 7 questions, so please scroll to the end. I have closed the survey. We have had a great response. Thank you to everyone who took the time to respond, share the link with friends and tweet a link to this post. Mel & I will discuss the results later this week and work out how to take things forward. I’ll post more in the very near future about Seedy Penpals. Mel & I have now had a long discussion. We think this is a great project and we have started to work to make it happen. If you’d like to be updated by email when we have more news, please fill in the form below. Make sure you don’t miss out! We’ve done it! Seedy Penpals is now ready to go.